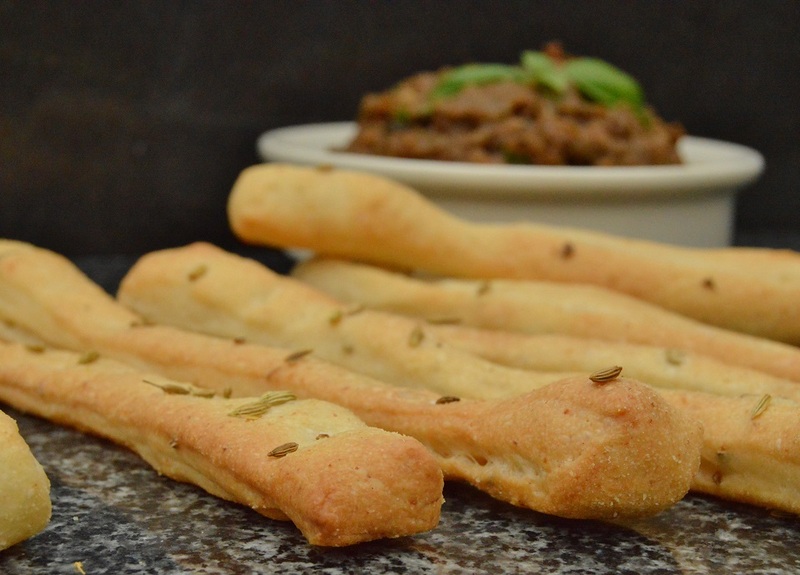 These are very easy breadsticks to make. 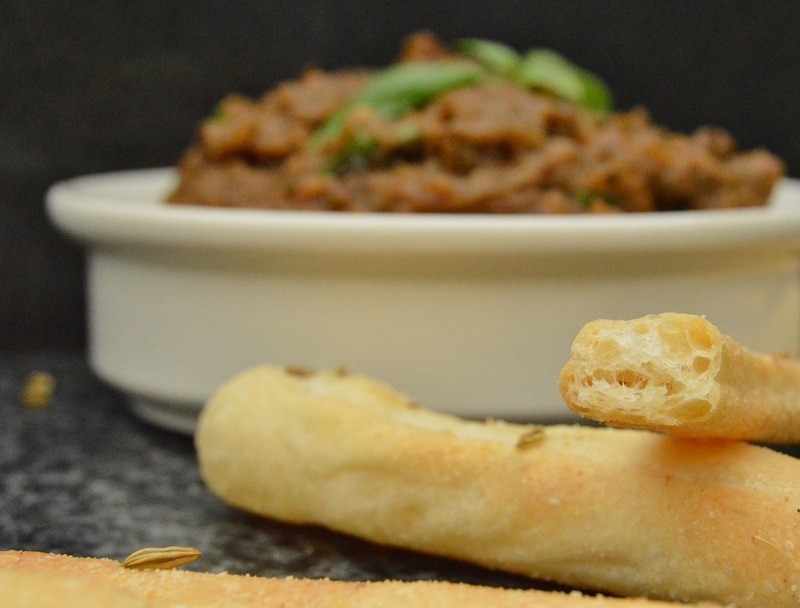 They taste wonderful and a large batch can be made at a fraction of the cost of shop-bought breadsticks! 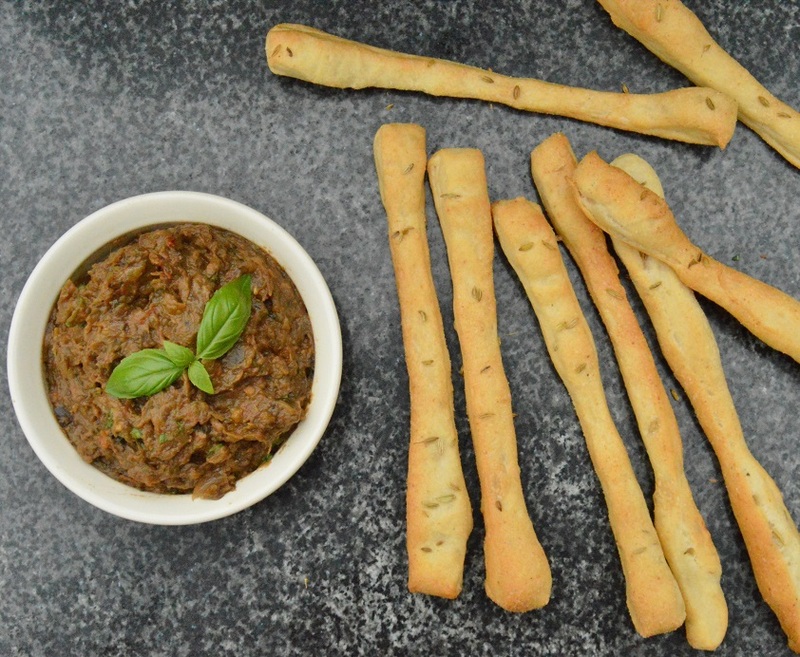 Perfect with any dip, although I have photographed these breadsticks with baba ghanoush, that wonderfully smokey aubergine dip (recipe here). I have used quite a lot of water in this dough, going more for a focaccia-type breadstick, resulting in lots of wonderful, irregular-sized holes in the breadsticks, while still having a lovely crunch to them. The dough is put together in moments, kneaded in a food mixer (for total ease) and left to prove/rise while you get on with other things. One of the beauties of these breadsticks is you do not have to be precise when you cut them: rustic, random is the way forward here! 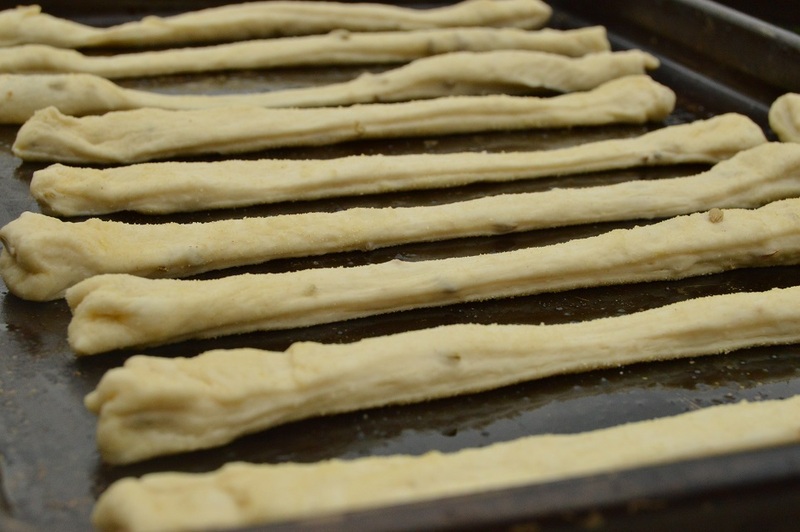 You can also stretch them out for thinner breadsticks or have them chunkier. (1) Put the flour, salt, yeast, fennel, oil and 150ml of the water in the bowl of a food mixer, with the dough hook attached. Starting on the medium setting, knead to form a very soft dough, adding more water if needed. You want the dough to be quite sticky here. (2) Knead for about 10-15 minutes on medium setting, or even increase it a little, until the dough is smoother: it will be quite slack but that is perfect in this case. (3) Transfer the dough into an oiled rectangular tin (a swiss roll tin is ideal) and with oiled hands gently spread it out (it doesn’t have to fit in perfectly). Cover with clingfilm (the oil on the dough will stop it from sticking) and leave to rise at room temperature for an hour or so, until the dough is well risen. (4) Turn out onto the work surface that has been dusted with the fine semolina or flour and lightly stretch out to give a thin rectangle of well aerated dough. (5) Use a knife to cut thin strips width-ways and lay these on baking sheets that have been lightly oiled: you can stretch these out further if you want them even thinner. (6) Sprinkle over a few fennel seeds and lightly pat onto the dough so they stick. Leave for about half an hour at room temperature. Meanwhile pre-heat the oven to 190C (fan). Bake for about 10-15 minutes until golden brown and transfer to a wire rack to cool.